North Carolina Speedway, in the sparsely settled Sandhills of southeastern North Carolina, was very much a local project at its inception. The track, originally christened North Carolina Motor Speedway, began as a joint venture by South Carolina land developer Harold Brasington (who built Darlington Raceway, NASCAR's first superspeedway, in 1950) and Bill Land, who owned the property the speedway came to occupy. Realizing they needed financial help, Brasington and Land approached prominent local lawyer Elsie Webb, who assembled a group of backers. The money group also sold shares to local residents for a dollar a share. The track at one time had about 1,000 shareholders. 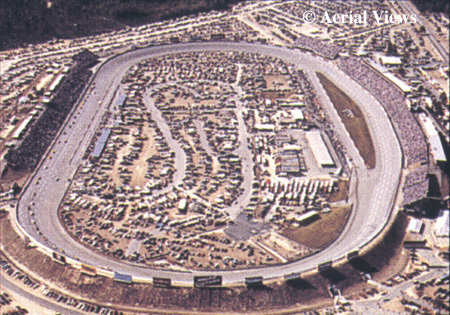 North Carolina Speedway's first race, the NASCAR American 500, was held Oct. 31, 1965. Over time, the track came under control of L.G. DeWitt, a local trucking company executive who served as speedway president for 20 years. DeWitt supervised reshaping the original flat mile track into the present, banked 1.017-mile oval in 1969. North Carolina Speedway, first and foremost, became the domain of NASCAR's heroes, with Richard Petty, Cale Yarborough, David Pearson, Bobby Allison and Buddy Baker setting (and in many cases, still holding) records at the speedway. The historic speedway became the center of a struggle for control among major racing powers in the 1990s, after Mr. DeWitt passed away. Penske Motorsports, Inc., ultimately gained control of the track on Dec. 2, 1997. It then became a part of International Speedway Corporation in July, 1999. North Carolina Speedway hosts two annual NASCAR weekends, both of which comprise events for the NASCAR Winston Cup Series and NASCAR Busch Series Grand National Division. Location:U.S. Highway 1 North, 10 miles north of Rockingham, N.C., and approximately 20 miles south of Pinehurst/Southern Pines, N.C.